Efforts to decarbonise will kill millions in poor countries. London 4 May 2018. A new report from the Global Warming Policy Foundation finds that climate and green energy policies promoted by development organisations will cause millions of preventable deaths in the developing world. The report, by eminent epidemiologist Mikko Paunio, says that international bodies and NGOs are trying to prevent poor countries from expanding their use of conventional fuels, have abandoned the so-called “energy ladder” — the gradual shift to cleaner types of fuel that underpinned the clean up of air quality in industrialised nations. Domestic combustion of solid (bio)fuels is by far the number one global pollution problem. 4.3 million deaths annually are directly attributable to indoor air pollution (IAP) according to the World Health Organization. Domestic combustion of solid biofuels kills almost six million people per year when its effects on ambient air quality are also taken into consideration. The so called ‘energy ladder’ was introduced as a way of understanding how deaths from IAP might be prevented. The energy ladder seeks to reproduce the experience of rich countries, where households moved away from biofuels and were increasingly connected to electric grids or district heating systems, solving the IAP problem for good. However, ever-growing resistance from the environmental movement has removed this beneficial approach from the development agenda. 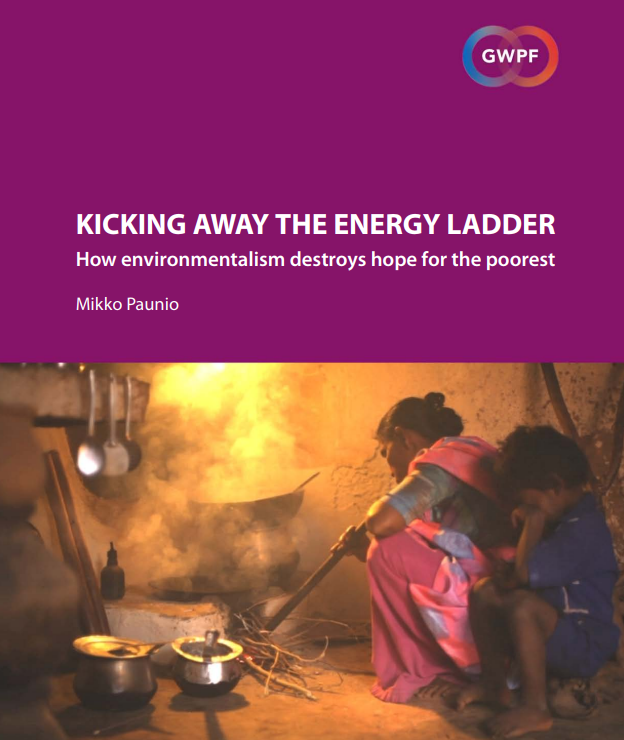 Environmentalists fear that by taking steps upwards on the energy ladder, from dirty solid fuels such as cow dung or crop residues, and towards use of electricity, poor countries would become wealthier and so increase their energy use and their carbon intensity. They have managed to persuade all important multilateral development bodies and the WHO to drop the energy ladder entirely. Instead, they are now coercing the poorest countries to adopt utopian energy policies based on renewables. The result is that combatting IAP in, say, sub-Saharan Africa, is becoming impossible. Aggressive decarbonization is now high on the political agenda. Contrary to the widely disseminated claims of important global actors, this will not solve the problem of IAP. Moreover, it will hamper the expansion of electric grids, which is a critical prerequisite for delivering adequate water supplies, without which it will be impossible to reproduce the public health miracle experienced in the rich countries. These ‘ambitious’ global climate mitigation policies leave environmental health problems amongst the poor unaddressed and will result in the loss of over 200 million lives by 2050. They are also unlikely – even in theory – to prevent the 250,000 annual deaths that the WHO speculates will be attributable to climate change between 2030 and 2050: high-quality IPCC-linked research has recently shown that solid biomass combustion actually increases CO2 emissions, at least over the next 100 years, compared to fossil fuels.